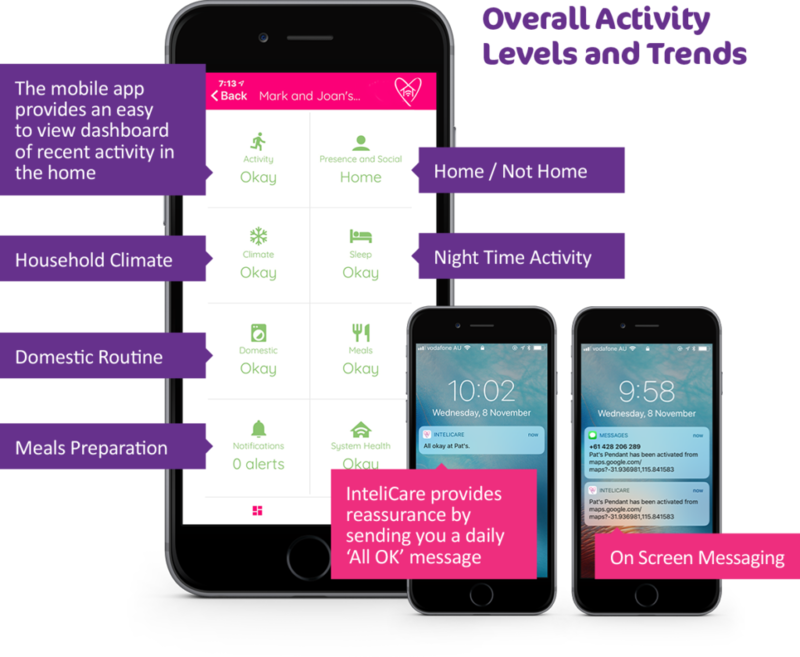 InteliCare provides real-time information on your in-home client’s activity and other indicators, to help care professionals define, monitor and assess care plans and strategies. 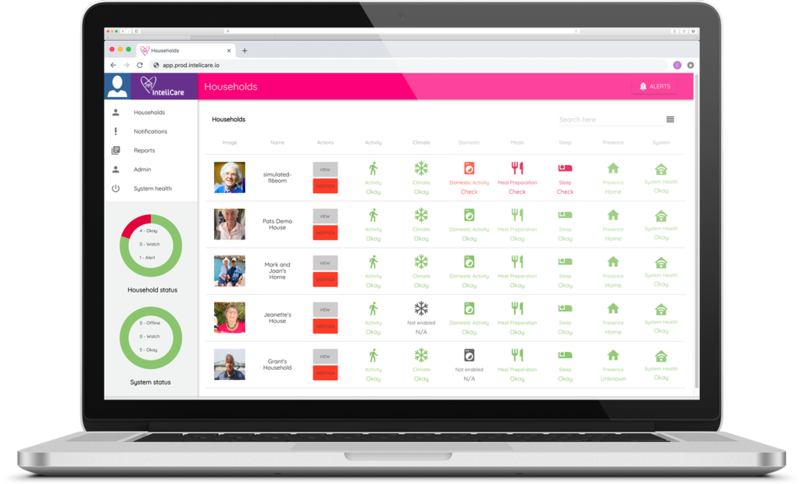 A simple to use dashboard provides a 24/7 view of client’s wellbeing with potential issues or alerts highlighted for escalation by a care contact centre, a mobile carer or first responder. From day one, InteliCare builds a profile of what a normal domestic routine looks like for each home. Using advanced analytics, the system can quickly identify when something unusual occurs, sending notifications or alerts to the nominated persons. The system supports remote assist (intercom) calls into the home when alerts are received from a pendant or identified by the system. 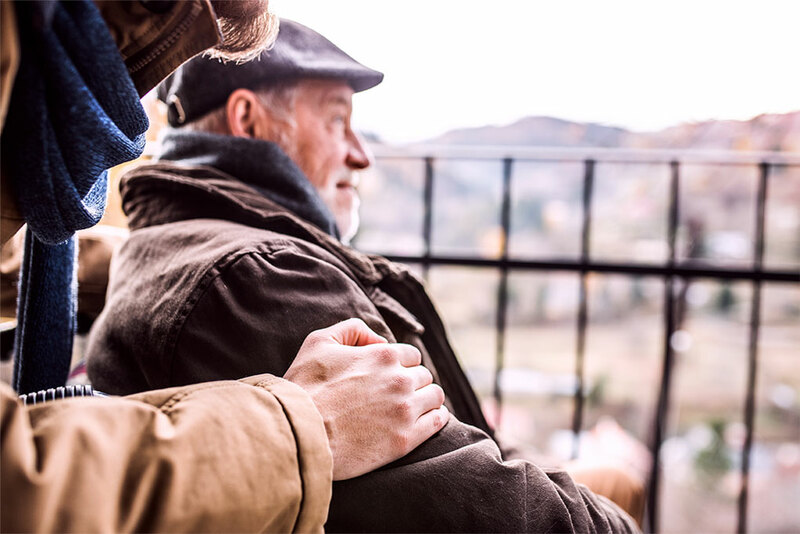 The InteliCare App enables the care team and family to easily see in real-time when an alert has been responded to, by who, with notes on the event recorded for future reference. Our 24/7 Operations Centre ensures all systems are operating and maintained effectively. As well as improving the safety and wellbeing of your clients, the analytics and reporting capabilities of InteliCare support the transition from reactive to truly proactive care. Enhanced visibility into the home routine, activity trends and event histories enable care professionals to guide conversations, improve care plans and enhance quality of life for their clients. Our simple smart phone application conveniently provides direct, 24/7 access for family, friends and carers. Upon detection of a potential issue the InteliCare interface will send alerts via the App and SMS for rapid response. All notifications and alerts are centrally stored in the InteliCare database and displayed on the mobile App. The interactive touch screen on the InteliHub provides for a range of two-way interactions between the resident and carer.